A business classic on team building shares techniques for building strong teams and results. Open innovation may be the latest buzzword, but it's value to chemical engineers goes well beyond a shiny new expression to toss about. Check out this review of one of the latest books dedicated to the subject. Chemical engineers know about many important topics, but life insurance might not be one of them. Fortunately, you can easily learn the basics about life insurance. Business Model Innovation: Concepts, Analysis, and Cases by Allan Afuah. Routledge, 2014. 358 + xvi pages. US$73.95 (soft cover). Navigating Strategic Decisions: The Power of Sound Analysis and Forecasting by John E.
This month CEP features a look at lignocellulosic biofuels, from various production processes to what's needed to scale up bioenergy operations. The Wide Lens: What Successful Innovators See That Others Miss by Ron Adner. Portfolio/Penguin Press, 2013. 267 + x pages. US$17.00 (paperback). This month, a feature on how humidity affects powders, tips for improving boiler system performance, discussions about the great water-energy-food challenge, and much more. Russell Walker’s recent book, Winning with Risk Management, offers lessons for chemical engineers as we deal with risks on a daily basis. CEP editor in chief Cynthia Mascone takes a look at the periodic table, with plenty of trivia and fun. How well do you know the periodic table? In this issue, CEP looks at managing raw material supplies, and focuses on solid-fluid equilibrium modeling, and SEP certification. You'll also find a great preview to this year's Annual Meeting in Atlanta. Siluria says that it's solved one of the hardest problems in petrochemistry: the oxidative coupling of methane (OCM) into ethylene. This month, CEP looks at safety and the dangerous illusion of attention. You'll also find articles on heat exchanger models in simulation, tips on how to characterize particle size and shape, and much more. What type of leader are you, and what are your strongest abilities? Learning to lead means understanding where your strengths as a leader lie so you can also learn to manage your weaknesses. Do you know how to choose the right insulation for a given situation? Check out this month's CEP magazine, and also learn more about other topics, such as mitigating air pollution with catalytic technology, and using pressure sensors. Getting your first job is just the start. Even with the best chemical engineering education under your belt, every job will present new challenges. Following is some great advice to help make the transition easier. Take a guided tour through an oil refinery in the pages of CEP this month, and learn about 3-D printed prosthetics, the latest in biofuels, and much more. This month, CEP turns an eye to industrial water reuse. You'll also find best practices for pilot-plant piping, a look at Italy's chemical industry, and much more. This month in CEP, a look at crystallization process design, size control valves, pressure measurement, and much more. This month CEP looks at controlling boiler emissions, reviews distillation revamp pitfalls to avoid, and presents an unconventional approach to process safety. 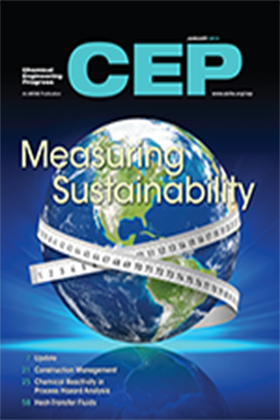 This month, CEP looks at the milestones in the field of mixing, as well as reviewing sustainable steam-trap management, fermentation fundamentals, and much more. Many chemical engineers are engaged in tactical implementation rather than strategic project development. However, understanding the firm’s strategy can help improve project selection, team organization, and profitability at a company. How Can ChEs Get the Most out of Career Fairs? Have career or job fairs been part of your job search strategy? This month, CEP takes a close look at choosing the appropriate flame arrester. You'll also find much more, including articles on bench-scale engineering (BSE) and details on AIChE's ScaleUp program, through which corporations provide support for ChE students. Learn how one grad student in biological engineering has increased his professional reach and enriched his career as a volunteer. This month, a special supplement on biochemical engineering with a focus on the work of D. I. C. Wang, founder of the Society for Biological Engineering (SBE). This month, CEP features lithium-ion batteries, looking at battery basics, their many uses, and much more. How Are You Keeping Your Skills Up-to-Date? We'd like to share your story with others in CEP magazine. Lou Russell’s new book, Managing Projects, is great for anyone new to the concepts and methodologies of project management. This month, CEP features process burners and what you need to know to select one for your application. Getting Ahead by Killing Your Company? Lisa Bodell’s new book, Kill the Company, offers an entertaining and contrarian view to shake up the status quo and bring about change and innovation. This month, a feature on using, handling, and storing hydrogen safely, plus centrifugal compressor performance, a look at jobs from shale gas investments, and much more. In this issue, check out the results of the 2013 AIChE Salary Survey, learn how to select the right centrifugal compressor, read up on electrostatic hazards in process operations, and much more. When is the last time you read a novel that offered insights you could apply on the job as a process engineer? Check out the classic The Goal for a must-read drama that takes place inside a manufacturing plant. This month, CEP features a look at improving process safety with near-miss analysis (full article downloadable). You'll also find tips for selecting energy-saving flowmeters, developing an effective air-pollution-control strategy, and much more. This month, CEP features membrane filtration and also looks at a variety of other news and topics, including a look at the latest on graphene, Singapore's chemicals industry, and much more. How Do You Generate Great Ideas? Idea Stormers by Bryan Mattimore is s a terrific reference for any manager or leader trying to find creative solutions for engineering or business problems. This month, CEP features the technology of drug delivery. Plus the issues looks at the latest news, tips you can use to build your career, and more. The Invisible Element is an interesting book for chemical engineers interested in building better problem-solving teams. Questions about career transitions? Or want to know more about using recycled water for cooling tower makeup? Check out this preview of February's CEP Magazine for these topics and much more. Need to create a jaw-dropping presentation? Cynthia Clay’s Great Webinars can help chemical engineers create presentations that are more captivating and informative. This month, CEP takes a close look at loop tuning, with a look at guidelines and strategies. You'll also have a chance to learn more about improving process hazard analysis (full-article download included), learn more about chemical industry prospects, and much more. This month CEP looks at biological chemical engineering, focusing on the intersection of nanotechnology and biology. In this month's preview your also have access to the full text of "Easy Ways to Improve Energy Efficiency." This month's CEP magazine focuses on what it takes to successfully patent your ideas. You'll also find advice on smart column design, cutting agitator power costs, and more. In the most recent editorial in the series, Cindy Mascone looks at sports and the efforts the industry is making towards sustainability. Have you been challenged by difficult colleagues or by other workplace relationship conflicts? Then maybe Peer Power should be next on your reading list! Read about the smart manufacturing revolution, brush up on using process flowsheets as communications tools – including P&IDs, PFDs, and BFDs – and much more! Through our work as chemical engineers, we have the potential to make significant positive impacts on sustainability. There’s also much we can do as individuals. Read on for thoughts on reducing your carbon footprint at work. AIChE is working towards sustainability on multiple fronts. It has formed the International Society for Water Solutions (ISWS) and the Association's Institute for Sustainability (IfS) has created the AIChE Sustainability Index, which companies can use to benchmark their sustainability performance. You'll also notice changes this year at the Annual Meeting, with the aim of a more sustainable gathering in Pittsburgh. In this month's preview of CEP magazine, read how bio-based materials are making their way into the operating room. Also check out safety features on handling corrosive acids and caustics, read about the newest materials and the most recent developments in biofuel, and more. In part one of a series on sustainability, CEP editor Cindy Mascone shares thoughts and observations about water resources and the environment that were inspired by a recent trip to the Grand Canyon. This month a 32-page special section of CEP focuses on the entire shale gas supply chain. You'll also find advice on choosing process vacuum pumps, an overview of Spain's chemical industry, learn the latest on algae oil production, and more. This month CEP looks at using cloud looks to collaborate, takes a closer look at centrifugation and the selection of a centrifuge, delves into modeling and virtual reality, and more. This month's issue of CEP focuses on bio-based materials, looking at both the opportunities and challenges. You'll also find in this issue a guide to intellectual property for ChE's, updates on the latest news, and much more. Outside the realm of most technical literature that chemical engineers might typically encounter, “Jumping the S-Curve” offers insights into how high-performing companies function. Individuals working in technology fields will find this book important to help identify top performing companies for employment. This Sunday the world will celebrate Earth Day once again, but if thoughts of the Earth's future cause you more pessimism than hope, then the new book Abundance may be exactly what you need! According to co-writers X-Prize Founder Peter Diamandis and journalist Steven Kotler, the future looks bright, and technology's rapid growth is the reason. This month, CEP Magazine's Back to Basics looks at minimizing the risks of flammable materials. Also covered this month are bulk solids segregation problems, Taiwan's chemical industry, and news about the latest in chemical engineering, from nanoglue to carbon management and a progress report on the recovery of Japan's chemical industry. Clayton Christensen is perhaps most famous for identifying the concept of a disruptive innovation – a new technology that introduces new markets and new ways that people interact with products. His latest offering, The Innovator’s DNA, co-authored by Jeff Dyer and Hal Gregersen, takes a look at what skills lead a person to innovation and creativity. February's issue of CEP magazine looks at heat exchanger baffling and environmental law for chemical engineers, plus offers tips for dealing with yield-stress slurries and much more. Ever wonder what stories are told around the campfire at Chemistry Camp? Well, the Disappearing Spoon: And Other True Tales of Madness, Love, and the History of the World from the Periodic Table of Elements by Sam Kean might just be the greatest collection of chemistry campfire stories. This month, CEP looks at measuring temperature by direct contact, solids and fluids handling, eye protection, and much more. Read on for a full-article preview and more about this month's issue. This month CEP features a look at various aspects of carbon capture and storage (CCS), including technology integration, legal questions and locating viable sites for CO2 sequestration. Take a look at what CEP magazine has lined up for July. This issue features pilot plants and includes features on mastering baffle tray capacity, reducing piloting time and cost, developing screening cost estimates, and much more.